Handling appointment objections successfully will mean you’ll convert more cold calls to sales appointments and have more opportunities earn commission or grow your business. There are types of objections that are unique to the early stages of appointment setting calls. 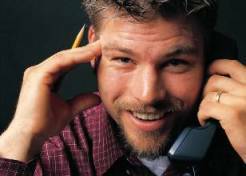 In the Introduction Stage of your call you can often get smoke screen objections and untrue excuses that stop the call. For objections that occur later in sales appointment calls see the links to more sales training on handling objections further down the page. Objections at the Introduction Stage of the appointment call are often smoke screens, not real objections, just excuses to try to get you off the phone. I’m on my way out, can you call back. We have no budget until next year. I’m in the middle of a meeting. The prospect doesn’t see any benefit in listening to your call. They think that what they were doing before you called is more important. Some prospects fear they may have to make a decision if they listen to you. In summary, you’ve not grabbed their attention. It’s difficult to handle appointment objections that are smoke screens using normal objection handling techniques. This is because they are not based on specific issues, they are just excuses not to talk to you. The prospect may be about to do something else, or may not have any available budget left this year. But how many times have you found time or money that wasn’t really available to do or buy something that grabbed your attention. What they are really saying is that you haven’t grabbed their attention, and they don’t see a potential benefit that interests them. The effective way to prevent these smoke screen appointment objections is to create an Introduction Stage that uses benefits to quickly grab the prospect’s attention. Getting the prospect to see the potential benefits of talking to you are the key to preventing appointment objections at the Introduction Stage. As you introduce you, your company, and your products or services, give a wide ranging potential benefit the prospect may be able to receive. You've given your name and now you want to introduce the company. When you state your Reason for Calling, make sure there is a big potential benefit for the prospect that grabs their attention and keeps them listening. At this stage of the call the prospect doesn’t want detail, they don’t want long winded features, they want benefits. You’ve interrupted whatever they were doing and you now have a limited time to explain who you are and why you are calling, and it has to sound more important than what they were doing when you called. If you get a lot of objections at the Introduction Stage, or if you want to see how to weave benefits into your Introduction Stage, take a look at the free sales training I use with my teams on creating an effective Introduction cold call script. Sometimes you do get real objections at the Introduction Stage. When handling appointment objections that are real you start by putting them into one of two categories, objections you can overcome, and objections that are outside of your control. A prospect may tell you that they really have no budget or available funds to make a purchase this year, and after questioning it you believe it’s a real objection and not a smoke screen. You then need to decide if you want to carry on and try to make an appointment, or if the circumstances mean you cannot sell to the prospect. You could continue with the appointment call as you think you could persuade the prospect to use funds assigned to other purchases to buy your product. You might still want to meet the prospect and work on agreeing a purchase with a finance deal they can afford, or for when their new budget is available. Or, this objection may go into your category of outside of your control as you have no way of selling your products to the prospect. Once you have decided that there is no point meeting the buyer just close the call politely and move on to the next cold call. If you have decided the objection is within your control, and the prospect is worth meeting, the key to handling appointment objections that you get at the Introduction Stage is to influence the prospect to put the objection on one side until you meet. Your response should make the prospect aware that there may be a way that they could still receive the benefits of your product. You just need to ask them a few questions to check if it's worthwhile you both meeting to discuss further. You can use this as a Motivator to get them to move forward to the next stage where you ask them questions to qualify them as a potential customer before gaining their agreement to a meeting. A Motivator is Stage 3 of the appointment call process that I use with my sales teams. To see how to use a Motivator to get your prospects to move forward with you go to Cold Calling Scripts for Motivators. In this professional sales appointments course there is a full section that shows you in detail how to prevent and handle appointment objections. Preventing and handling appointment objections are covered in the course exercise program and the step by step instructions so you’ll learn to use the sales training with confidence. You’ll learn how to weave techniques that prevent objections into all the stages of your appointment call and make it easier to overcome any that you do get. With this training course you will have everything you need to make as many sales appointments as you want and be able to teach others how to do the same. Already proven to work by the sales teams I’ve managed and trained. Complete exercise program to build your appointment call in your own words. Use for your own personal training. Present to your teams, comes with Power Point slides and separate exercise workbook. Enjoy making professional cold calls with confidence. Fill your diary with selling opportunities. See the professional sales appointment workbook training course training course that I use with the teams I manage and train.